For a while now, that same question has been posing itself on many friends shocked by the positions and comments of writers and reporters united in viciously criticizing the revolution, not out of concern nor “neutrality”, nor even as a result of their rejection of the revolution’s errors and impurities, which certainly exist and are plentiful. Let us push the question even further. Why is the Syrian revolution unable to mobilize the activist segments of global or “Western” civil society, even though the media and public opinion generally empathize with it? The answer seems compound, and is based on a combination of factors which control aspects of the political and cultural viewpoint of the Arab region, as well as political and moral criteria governing many of the attitudes and writings concerned with the region. As a result of these factors, sympathy or solidarity with the revolution seems minute compared to the brazen attacks, skepticism and perseverance of those holding hostile views. One of those factors is the fear which prevents many political players from taking a stand towards “conflicts” in the “complicated” Middle East, where wars and crises accumulate and religious tendencies intensify, spreading their effects across the Mediterranean, inevitably reaching it northern shores. There is also the prevalence of the “culturalistic doctrines” when comparing world issues and conflicts, particularly those associated with Arabs and their countries. Arabs appear to those “culturalistic” folks as people who habitually resort to violence in solving their conflicts, while drawing from a well of religious extremism, making it difficult to bet on their readiness to evolve towards democracy or to break free of the burdens of ‘Eastern despotism’. The severe violence associated with the Syrian conflict is therefore no exception in the context of the persistent ‘civil wars’ of the region, nor does it command surprise or urgent action. Another factor is ‘Islamophobia’, shared by the extreme right (for racist reasons) and certain leftwing factions (who hide behind the excuse of defending freedoms and secularism). That is how writers from the far right meet with some of those on the far left in supporting Assad’s tyranny under the pretext of his hostility to the Islamists (the former) and his ‘secularism’ (the latter). In addition of both sides, there are those who are obsessed with the issue of ‘minorities’, perpetuating miserable tales of the threats and resentment posed by the majority. This makes it easy for many political activists, especially students amongst them, to surrender to conspiracy theories and what they offer in terms of suspense, as well as pride garnered by understanding the “secrets” behind things, always stressing the malevolence of international relations. It used to be that leftist groups were more susceptible to becoming addicted to such theories. Now, however, the extreme right has also embraced them, especially those pertaining to ‘jihadist Islamic’ conspiracies, as well as international organizations being dens for plots which target the national makeup of countries, breaching their borders and sovereignty. Another factor lies in the disdain of certain progressive ‘prominent’ writers, who hold influence over public opinion, from dealing in the issues of people, and their dignities and freedoms. What they are concerned with are borders, oil and geo-strategies, as well as the influential roles of regional countries and the ‘West’s’ decisions concerning them. Some of them surely look at Russia and China contemplating the return of the Cold War. In this they border on being racist even if they are looking at things from the perspective of ‘fighting for the best interests of Arab countries’. This is because they deal with these countries as entities that lack real people with flesh and blood and rights, or as if their citizens were deaf and dumb masses driven and misled by ‘Western’ plans and lies, and all that is required of those citizens is to rally around those who can protect them (or claim to protect them) from the Imperialist attack, even if they are to be crushed in order to thwart the success of these foreign conspiracies! Another reason is the refrain of those intellectuals who championed the Palestinian cause with audacity and relentlessness from expressing advocacy of the Syrian revolution under the pretext of fear from Syria being torn apart or the spread of chaos in a way which would benefit Israel and America. Finally, these factors also include the readiness of writers who have built fame and credibility over decades by residing in the region and opposing their countries’ policies towards it, to lie and be hypocrites in return for continued spotlight, battling and contradicting what they deem prevalent in their countries’ media, even if it, along with their governments, this time do not go against the ‘humane’ standpoints which those writers have had always called for to be taken into account. We can also add to the aforementioned factors others which are linked to the boredom that has hit Western public opinion towards the Arab Spring phenomena, especially after the Muslim Brotherhood won elections in Egypt and Tunisia, and after the war in Libya, as well as the long time the Syrian revolution is taking. We can also note the geographical distance of the Middle East (in comparison to the geography and demography of North Africa). We can also talk of the skepticism held by many towards the Qatari and Saudi role in Syria and their worry that the situation will lead to the lack of stability in the entire region, as well as in Israel at its core. We must also not forget the efforts of the Syrian regime and its Lebanese and Arab allies, as well as some paid European experts, in peddling fabricated articles and information regarding the revolution and its plans as well as the horrors that threaten Christians and warnings of a repeat of the Iraqi scenario. The bottom line is that the Syrian revolution today is not only facing Assad’s brutal regime, but also its supporters, Russia, China and Iran, and is on top of those up against a considerable amount of rotten concepts that alternate between racism, indifference and moral disease striking the hearts of certain leftists and ‘anti-imperialists’. 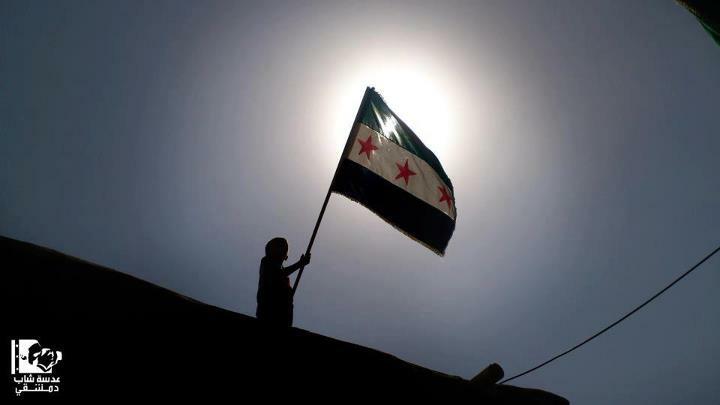 Even more, the Syrian revolution until now does not have a sound political leadership or a media apparatus with which it can deal with all the aforementioned factors. In return, however, the revolution does have legendary courage, as well as intellectuals, artists and activists with exceptional creativity, wisdom and nobility. It also has a reservoir of patience and hope which makes its ability to endure difficult to deplete, no thanks to any of its (ungenerous) allies. هذه المقالة كُتبت ضمن التصنيف إلى الإنكليزية, صحافة. الوسوم: culturalistic approach, Intellectuals, journalism, Leftist, rightist, Syrian revolution and the West, Western coverage of the Syrian revolution, Ziad Majed. أضف الرابط الدائم إلى المفضّلة. This brilliant young joairulnst is shedding light on a complex issue. It’s about time we make perspectives like his the norm in reporting from the Middle East. Thank you, Karam, and thanks Chris Hayes for bringing him on. I was riveted watching this segment.